INDIANAPOLIS -- Every year, roughly 600 Hoosier babies die before they get to celebrate their first birthday. It’s a staggering number, and one of the issues Governor Holcomb pledged to address during his State of the State speech Tuesday evening. Indiana is one of the ten worst states in the nation for infant mortality. According to the Indiana Department of Health 7.5 infant deaths are reported for every 1,000 births in the state. Of the 29 zip codes in Indiana with the highest mortality rate among infants, 13 of them are in Marion County. "We can and we will save more of them,' Holcomb said during his speech. Gov. Holcomb said he plans to implement a “Levels of Care” program in the state to ensure at-risk babies are delivered at the best possible facilities. He also pledged to become the best state in the Midwest for infant mortality by 2024. 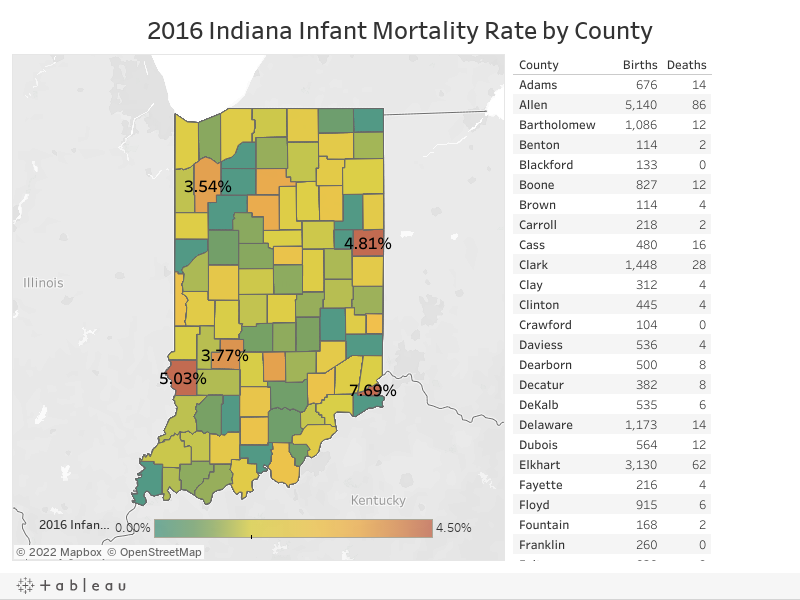 Below is a map of infant mortality in Indiana by county. To combat the issue, you must look at the underlying cause. "The reality is if we really want to change infant mortality - to have healthy babies - we have to have healthy moms," said Dr. Nancy Swigonski. "To have healthy moms we have to have healthy families and healthy communities." Dr. Swigonski says better care facilities will help, but one of the biggest ways to combat the rising infant mortality rate in the state is to focus on the mothers and the families who are giving birth. Creating safer environments for a child to thrive in starts before the baby is even conceived. According to the Indiana Department of Health areas where the rate is especially high are also areas of high crime and poverty. "Trying to juggle a job, living in an unsafe environment, paying the bills with little support within their family or neighborhood, those women have elevated stress hormones," said Swigonski. Pre-term birth accounts for two-thirds of infant deaths in the state. Another leading cause is what's called "sudden unexpected death,” which includes babies accidentally suffocating from a blanket during sleep or not sleeping properly on their backs.